After the great destruction which was recorded in 3 Nephi, the Lord’s voice was heard among the people, declaring that the “great city Moroni have I caused to be sunk in the depths of the sea, and the inhabitants thereof to be drowned” (3 Nephi 9:4). The cities of Onihah, Mocum, and Jerusalem suffered similar fates. Concerning them, the Lord declared that “waters have I caused to come up in the stead thereof” (v. 7). Samabaj offers a perfect example of the type of destruction experienced by the cities of Onihah, Mocum, and Jerusalem, as explained by the voice of the Lord. Rather than sinking into the sea or having a flash flood come crashing down upon them from above, the Lord declared that “waters have I caused to come up in the stead thereof” (3 Nephi 9:7; emphasis added). This is exactly what happened at Samabaj—the water level of its surrounding lake quickly arose and submerged it. This underwater settlement, which until recent times lay undetected at the bottom of a popular resort lake, demonstrates that the type of flooding mentioned in 3 Nephi is anything but farfetched. 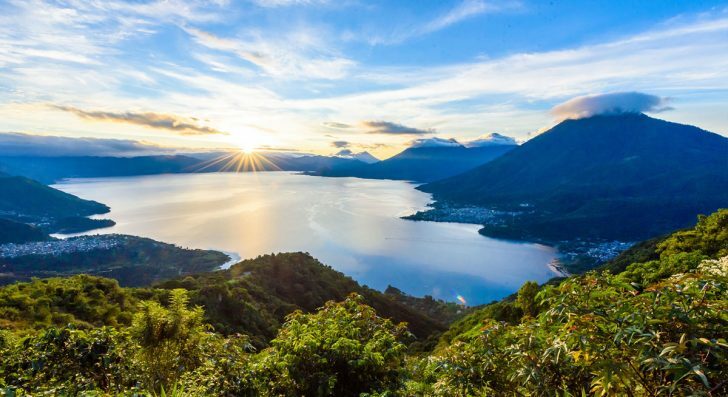 Interestingly, long before the discovery of Samabaj, several LDS scholars identified the region of Lake Atitlan with the waters of Mormon and placed Jerusalem, one of the sunken cities, near its shores.11 It remains uncertain, however, if Samabaj and its sudden flooding had anything to do with Book of Mormon peoples or the destruction reported in 3 Nephi. After discussing the symbolic and religious significance that Samabaj’s destruction may have held for its inhabitants, Atwood asked, “Did the ancient Maya know why the island was disappearing?”12 It may be similarly relevant to ask if Book of Mormon peoples knew why their cities were being covered with water. From heaven, the Lord’s voice was heard among the people, explaining that this was done “to hide their wickedness and abominations from before my face, that the blood of the prophets and the saints shall not come up any more unto me against them” (3 Nephi 9:7). This reasoning is actually quite similar to the Lord’s justification for sending the flood in Noah’s time. In Moses 6:28 the Lord explained to Enoch that He would send the flood because “in [the people’s] own abominations have they devised murder, and have not kept the commandments.” These “abominations” were first introduced by Cain, who slew his brother Abel (Moses 5:25). In response to Cain’s murder, the Lord declared, “The voice of thy brother’s blood cries unto me from the ground” (v. 35). Paul Y. Hoskisson and Stephen O. Smoot, “Was Noah’s Flood the Baptism of the Earth?” in Let Us Reason Together: Essays in Honor of the Life’s Work of Robert L. Millet, ed. Spencer Fluhman and Brent L. Top (Salt Lake City and Provo, UT: Deseret Book, Neal A. Maxwell Institute of Religious Scholarship, and Religious Studies Center, Brigham Young University, 2016). John L. Sorenson, Mormon’s Codex: An Ancient American Book (Salt Lake City and Provo, UT: Deseret Book and FARMS, 2013), 133–135, 647–648, 664. John L. Sorenson, “The Submergence of the City of Jerusalem in the Land of Nephi,” Insights 22, no. 155 (2002): 2–3. 1.Roger Atwood, “Lost Island of the Maya,” Archeology 68, no. 4 (2015): 42. 2.Based on an unpublished geophysical survey examined by Book of Mormon Central staff. 3.John L. Sorenson, Mormon’s Codex: An Ancient American Book (Salt Lake City and Provo, UT: Deseret Book and FARMS, 2013), 647. 4.Atwood, “Lost Island of the Maya,” 42. 5.Atwood, “Lost Island of the Maya,” 43. 6.Atwood, “Lost Island of the Maya,” 42–43. 7.Atwood, “Lost Island of the Maya,” 43. 8.Based on an unpublished geophysical survey. See also, Atwood, “Lost Island of the Maya,” 42. For information about the natural disasters in 3 Nephi and their likely connection to volcanic and geological activity, see Book of Mormon Central, “What Caused the Darkness and Destruction in the 34th Year? (3 Nephi 8:20),” KnoWhy 197 (September 28, 2016). 9.Sorenson, Mormon’s Codex, 647. According to Sorenson, his proposed Book of Mormon geography “plausibly places the city of Jerusalem on the south shore of the Lake Atitlan. The near agreement in time between the flooding described in the Book of Mormon city and the rise of the lake waters over Samabaj, as well as the seemingly abrupt manner of that rise, is striking.” Although the timing of Samabaj’s flooding may be too late, Sorenson’s geographical correlation is still intriguing and deserves further consideration and exploration. 10.Atwood, “Lost Island of the Maya,” 42. 11.John L. Sorenson, An Ancient American Setting for the Book of Mormon (Salt Lake City and Provo, UT: Deseret Book and FARMS, 1985), 175–176, 223–225; Bruce W. Warren and Thomas Stuart Ferguson, The Messiah in Ancient America (Provo, UT: Book of Mormon Research Foundation, 1987), 44; Joseph L. Allen and Blake J. Allen, Exploring the Lands of the Book of Mormon, rev. ed. (American Fork, UT: Covenant, 2011), 637–646, 737–740. 12.Atwood, “Lost Island of the Maya,” 45. 13.Notably, it was immediately after the flood in Genesis that the Lord explained the symbolic importance of blood to Noah: “Every moving thing that liveth shall be meat for you … But flesh with the life thereof, which is the blood thereof, shall ye not eat. And surely your blood of your lives will I require; at the hand of every beast will I require it, and at the hand of man; at the hand of every man’s brother will I require the life of man” (Genesis 9:4–5). 14.The symbolism of hiding or covering sins from before the Lord’s face hearkens back to the story of Adam and Eve, who, after partaking of the fruit of the tree of knowledge, “hid themselves from the presence of the Lord God” (Genesis 3:8). See also 2 Nephi 9:14, Mormon 9:5; Lamentations 1:8; Isaiah 47:3; Revelation 3:18. 15.See Paul Y. Hoskisson and Stephen O. Smoot, “Was Noah’s Flood the Baptism of the Earth?” in Let Us Reason Together: Essays in Honor of the Life’s Work of Robert L. Millet, ed. Spencer Fluhman and Brent L. Top (Salt Lake City and Provo, UT: Deseret Book, Neal A. Maxwell Institute of Religious Scholarship, and Religious Studies Center, Brigham Young University, 2016) 163–188. Thanks for the fine article. I would change the title to "Cities Covered with Water" rather than "Sunken Cities," as the cities did not sink into the water. It would match the thesis of the article. The comment that the "quote attributed to Joseph Smith naming central America as the Book of Mormon setting, has since been credited to someone else" is inaccurate. A more careful reading of this portion of Church History clearly demonstrates that the Prophet was either hiding right in Nauvoo, or just across the Mississippi River with daily visits from his family and colleagues, who ran messages to and from him to conduct his business (including his editorial responsibilities). He said that upon assuming the Editor position, he was responsible for the content of the Times and Seasons publication. When he came out of hiding, he did not retract the Central America editorials/articles published under his editorial supervision. (Several are signed: -ED [Joseph Smith, Editor].) Finally, the city Zarahemla, on the western banks of the Mississippi referred to in the D&C, was given the name by the Saints prior to being referenced in the revelation. 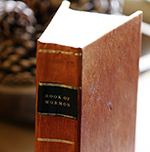 The D&C reference to it is no more proof that it was the ancient Zarahemla of the Book of Mormon, than that the cities of Nephi, Bountiful, or Lehi, also named by the Saints in Utah, are the ancient Book of Mormon cities. I agree with Courtenay. Also, The Book of Mormon makes it very clear that their buildings were made of wood; including the Temple of the splendid buildings of King Noah were made of wood and metal. When there was a scarcity of wood they used cement or dwelt in tents. All the great events of the past, starting with Adam right up until the last days, all point to the north.